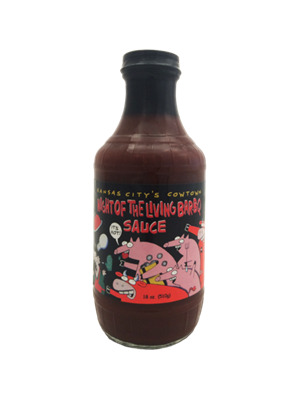 Reanimate your taste buds with this killer hot barbecue sauce. Howling good when splattered on beef, pork, poultry or fish. Repeat after me: "It's only a barbecue sauce . . . It's only a barbecue sauce. . . It's only a barbecue sauce. . ." 18oz. Natural Ketchup, Brown Sugar, Chipotle Puree, Water, White Vinegar, Sugar, Spice Blend, Natural Smoke Flavor, Mustard Powder, Chipotle Powder, Molasses, Black Pepper, Garlic Granules, Onion Powder, Tamarind Concentrate, Cayenne Powder, Salt, Garlic Powder, Spices. You'll never taste another barbeque sauce that is better than the cowtown brand.i had friends over for ribs they thought the sauce was in a league of its own never told them what it was until weeks later lol .